Home » The Cult of "Geniuses"
In the world of "economic science" some "gods" appeared, which can be worshiped, but with whom one can not argue, who can not even be suspected of any mistakes and errors. People who engage in "economic science" acquire the status of "genius" and even "god" after they receive the title of Nobel laureate in economics. Until then, the correctness of such people can be questioned, they can be argued and they can be refuted. After they receive the Nobel laureate's title, they can only be humbly listened to, they can and even need to be invoked. 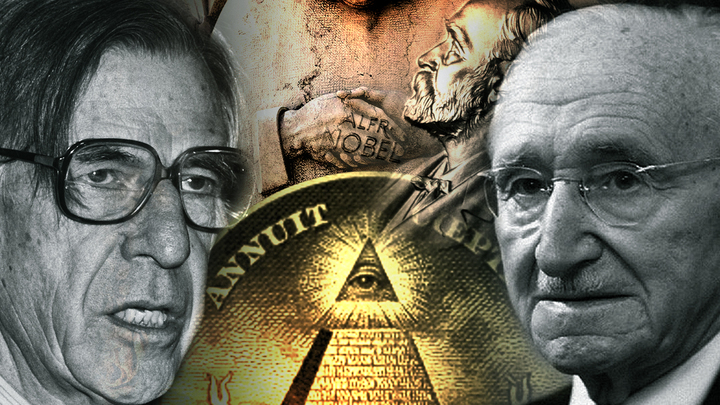 If in the XIX century the first Vatican Council adopted the dogma of "infallibility of the pope", then in the second half of the twentieth century there was an informal dogma of "the infallibility of the Nobel laureate in economics". Is there such an unwritten dogma of the "infallibility" of Nobel laureates in other sciences, I can not say. But there is a cult in the sphere of "economic science". All the so-called modern "economic science" is built on deception. The organizers and creators of the "economic science" do not disclose their cards. The final customers of the "economic science" are the "owners of money" - the main shareholders of a private corporation called the "Federal Reserve System of the USA." A small group of honest economists wrote about the true aims of a global and long-term project codenamed "Economic Science," but they are "jammed" with gigabytes of false information. For most of the twentieth century, the world-famous American economist John Kenneth Galbraith (1908-2006) worked on the project "Economic Science". This specialist for many decades bathed in the rays of glory and honor. He taught at the California, Harvard and Princeton universities. President of the American Economic Association (1972). Laureate of the awards of Frank Seidman (1975), Veblen-Commons (1976), V. Leontiev (2000). But a few years before the end of his very long life, this American professor began to feel strong remorse, feeling that most of his life he spoke and wrote something else. Or even not at all. Simply put, he lied. So the light in early 2004 appeared the last book of the American economist. You could say a confession book. Her name is very remarkable: The Economics of Innocent Fraud. In it he reveals the lies of the official "economic science". This book was translated and published in Russian. It says that under the guise of "economic science" an ideology is created that is needed by the "masters of money" so that they can effectively manage mankind and, ultimately, become "masters of the world". This pseudoscience has nothing to do with the economy, which in Greek means "house-building." The so-called "economic science" is aimed, on the contrary, to destruction. On the destruction of man and the building of the economy, which was created by previous generations of people. The project entitled "Economic Science" is a multidisciplinary and multilevel. An important element of this design is the above-mentioned institute of the Nobel Prize in Economics. By itself, it is already a fraud. We know that the Nobel Prizes were established by a Swedish scientist, entrepreneur and philanthropist Alfred Nobel. This happened in 1895, when Nobel signed his will. It stipulated that most of his fortune - about 31 million Swedish marks - was to go on to establish prizes for achievements in five spheres of human activity: physics, chemistry, medicine, literature and for peace-building activities. There was no hint of economics in the will. But in 1968 the world flies by the news: in Sweden the Nobel Prize in economics (economics) is being established. The initiator of the award was the Central Bank of Sweden. Thus, he decided to celebrate the 300th anniversary of his existence. This award in the field of economic science has become the most prestigious in the world. Thus, this year marks the half-century of the existence of the Nobel Prize in Economics. The prize was first awarded in 1969. The first winners were the Norwegian economist Ragnar Frisch and the Dutch economist Jan Tinbergen (the formulation of the basis for its award: "For the creation and application of dynamic models to the analysis of economic processes"). Today there are already 73 laureates of this award. The last one is American economist Richard Teiler (2017). The basis for awarding the prize: "For contribution to the behavioral economy". If you do not go into details, most of the "products" of Nobel laureates can be classified as scholasticism, cabalistics (works are drawn with formulas and graphs), Talmudic wisdom (a bird language that is difficult to translate into human). There are exceptions among laureates and their works - however, confirming the general rule. Having received a "certificate of quality" in the Nobel Committee, the products of "economic geniuses" automatically get their way into the textbooks that every year the heads of millions and millions of young people in the universities and other institutions of higher education in different countries are clogging each other. An interesting question arises: how are professional economists selected for the title of Nobel laureate? Reflecting on this issue,Tthey were carefully prepared for this "take-off". Prepared morally, spiritually, psychologically, intellectually. Naturally, after the preliminary selection. The selection begins at the student's bench. The official name of one of these "incubators" is The Mont Pelerin Society, an international organization which, according to its official website, was founded by 36 scientists on April 10, 1947 at a conference held under the leadership of the famous economist of the Austrian school Friedrich von Hayek. The Society was named after the town of Mont-Pelerin in Switzerland, where the conference was held. Among the founders are Maurice Alles, Aaron Director, Walter Oaken, Milton Friedman, Henry Hazlitt, Bertrand de Jouvenel, Ludwig von Mises, Frank Knight, Michael Polanyi, Karl Popper, Lionel Robbins, George Stigler. The organization declared its goal to promote the economic policy of the free market and the values ​​of an open society. To make this propaganda as effective as possible, the Society has used and continues to use all opportunities to enhance the scientific, social and political status of its members. And, of course, they could not pass by the possibility of nominating their members for the title of Nobel Prize winner in economics. The Company's activities in this area proved to be very effective: eight members of the Society became Nobel laureates. First of all, this is the very founder of the Society Friedrich A. von Hayek (1974). Other winners were: Milton Friedman, George Stigler, Maurice Allais, James M. Buchanan, Ronald Coase, Gary S. Becker, Vernon Smith. So, every ninth "economic" Nobel is a member of the Mont Pelerin. The destructive ideas of Nobel debutants repeatedly strengthened the world's media, controlled by the "masters of money." That there is one Milton Friedman, who became the father-founder of the modern school of monetarism. Friedman's ideas were very helpful in justifying the transformation of the real economy into a financial one (more precisely, in order to ruin the real economy by replacing it with virtual financial "bubbles"). the society "Mont Pelerin" is a Masonic lodge, and very closed. From the very beginning, it was supported and funded by British intelligence. It is noteworthy the time of creation of the society - 1947, the beginning of the "cold war" of the West against the USSR. The "Mont Pelerin" was entrusted with the task of participating in the economic war against the Soviet Union and the people's democracies by ideological loosening of the Soviet economic system. This can be read in many foreign and domestic publications. For example, John Coleman (a former British intelligence officer) writes in his book "The Committee of 300" that the Mont Pelerin society "is an economic foundation designed to spread false economic theories and influence the economists of the Western world so that they follow the models that this fund releases from time to time. His outstanding practices are Von Hayek and Milton Friedman. " To date, "Mont Pelerin" has about 500 members. The meetings take place every two years, every time in a new country. And - in a secret environment, more secret than even the meetings of the Bilderberg club. Thirty presidents have been replaced since the formation of the society. Since 2016, American Peter Bettke is in charge of "Mont Pelerin" is (Peter Boettke). He was elected to this post at the last meeting of the society in Miami (Florida). This year, another change of the president is to take place (nothing is known about the place and time of the next meeting of the society). Some members of the Mont Pelerin leave the organization after learning its true goals. And not all of them are silent. One of these "dissidents" is the well-known US economist Paul Roberts, who once was an assistant to the US Treasury Secretary and one of the authors of the economic policy called "Reaganomics." In 2008, Paul Roberts stepped out of society. He came to the conclusion that the Mont Pelerin society was no longer a defender of freedom, but instead became another instrument of US hegemony. It is obvious that the Mont Pelerin society is a bad tree. Consequently, Nobel laureates in economics, departing from this incubator, are "thin fruits". They are akin to the poisonous fruit that the first people tore from the tree of the knowledge of good and evil and poisoned themselves.